Climb long enough and you’ll have a close encounter … or several. 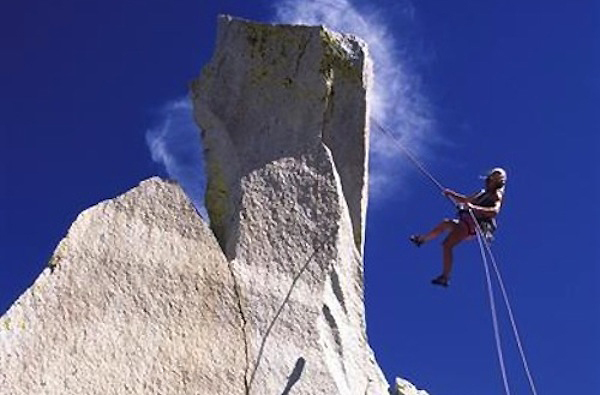 Of the myriad ways to kill yourself climbing, rappelling is the quickest, but also the easiest to safeguard. Climb long enough and you’ll have a close encounter … or several. Mine was in 1986 at Arches National Monument, five minutes up the black- top north of Moab. I had just rope-soloed a new route on the Organ, a five-pitch tower. Standing on the broad, plateau-like summit with night falling and no headlamp—I had expected to be down at my VW microbus well before dark—I rushed through my first rappel setup, anxious to beat an incoming storm. I strung the ropes through the rap station, shouldered the haulbag, which was loaded with enough pins, cams and paraphernalia for a Yosemite Grade V, and to save the time it would take coiling it, clipped a spare 9mm trail line so it dangled straight off my gear sling. I snapped on my rap device, leaned back into the twilight, and realized an instant too late that I hadn’t clipped to my rappel ropes. With a snivelling sob, I plunged like a sack of potatoes toward the bedrock approach slabs, 500 feet below. 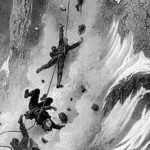 Until that moment, I hadn’t considered exactly how I would die, and now that I knew it was to be rappelling, I was ashamed. ‘Rappelling, dang dang it!’ I thought as I sped earthward. I dropped 150 feet through the air, past the ends of the rappel ropes, then, miraculously, wrenched to a halt. The 9mm trail line, haphazardly clipped to the shoulder sling I’d home-sewn on my momma’s Singer, had snarled and, whip-snapping above me as I fell, jammed in a crack—the only crack on the smooth Entrada face. It had wedged, Stopper-style, and caught me. The shock exploded the sheath off the rope, blew a third of the core strands, and bent the carabiner on my gear sling, but I walked away without a scrape. I scavenged bits of that tattered rope and made a series of short rappels to the ground, where I vowed that, from that moment on, I’d count on more than a guardian angel to back up my rappel. The most commonly used technique for backing up a rappel is to slap a prusik or ascender on the rope and clip yourself to it. In the event you lose control of the rappel, or, like me, come unclipped, the prusik or ascender will grab, provided you fight the urge to death-grip it. Sounds simple, but there are many methods for rigging a back- up. So, what really works? 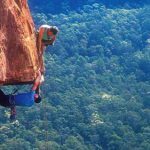 Of the myriad ways to kill yourself climbing, rappelling is the quickest, but also the easiest to safeguard. To determine the safest and simplest method, Rock and Ice tested a multitude of configurations, simulating rappel failures. The results were revealing. Both the prusik and ascender are serviceable backups, but only when you rig them just so and understand their limits. A prusik has the advantage of easy availability: You can tie one from almost any bit of cord or sling (but not Kevlar, which slips); it’s lightweight, cheap, and has no mechanical parts to break or gum up; and it works on single and double ropes. It also grips in any direction, which is handy for backing up traversing raps. 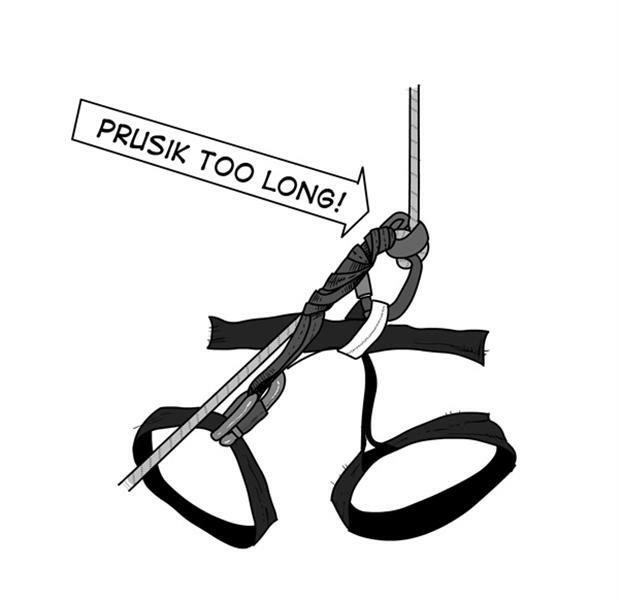 Perhaps best of all, you can put a prusik on the rope above or below your rappel device (more later). A prusik’s limitations are largely determined by user error. If you rig the prusik sloppily, fail to snug it up, or don’t wrap it enough times around the rope (at least three), it won’t grip. A prusik is also a bugger to set up with one hand. An ascender, such as the Jumar or any similar clamp, is a snap to attach to the rope with one hand, and is the common backup on big walls, where you often zip down fixed single ropes tied together. An ascender simplifies jumping these knots: Clamp your second ascender on the rope above the first ascender, clip into and weight it, remove your rap device, and replace it below the knot. Now, jump the lower ascender below the knot and above your newly established rap device, down- jug a move, weight your rap device, and remove the top ascender. The entire procedure takes roughly 10 seconds. The obvious disadvantage to an ascend- er is that it doesn’t work on double-rope rappels. Petzl (petzl.com) does offer a dou- ble-rope rappel backup, the Shunt, but it is a highly specialized device, one you’re not likely to carry at all times. 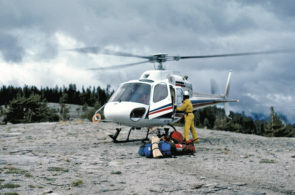 An ascender’s other flaw—apparent as soon as you attempt to use it as a backup—is that it will only work on the rope above your rappel device because it’s always either fully locked or fully open: You can’t squeeze an ascender in your brake hand as you can a prusik, letting the rope slip through. Being forced to keep the ascender on the rope above your rap device creates problems, some surmountable, some not (see below). In the 1970s, we were taught to place the prusik backup on the rope above the rappel device, which at the time seemed simple and logical. But, after an incident in which a prusik backup seized and the suspended climber was unable to release it (and suffocated, hanging in his swami), this system was the subject of much debate. What use was a backup, some argued, if it could kill you? Today, none of us is apt to die this way because we wear leg loops. Still, an ascender or prusik on the rope above your rappel device can leave you in a pickle. 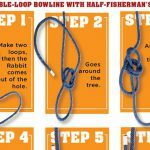 For instance, make your connecting sling too long—even a single inch can be too much— then, fast as a flash, your ascender or prusik can shoot out of reach, cinch up, and leave you stuck, dangling on the rope. Or, even if you dial the sling length perfectly, the prusik or ascender can lock up and leave you lacking a second ascender or prusik—unable to unweight and release it. Stranded again! 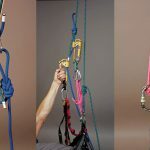 The ascender lesson: If you use an ascender backup, keep its connecting sling short so you can easily reach it at its maximum weighted extension. Also, always have a second ascender or prusik with a spare sling available. Then, if your backup locks and you are unable to “kip,” or bounce up, and release it, you can rig a standard ascender setup and jug to freedom. That said, avoid all of the above unpleasantries simply by using a prusik backup, and placing it on the rope below your rappel device. Set your backup prusik on the rope below your rappel rig and you can casually grip it in your brake hand, which encircles both the prusik and the ropes. Each time you release the prusik, letting it lock, you can easily fiddle it loose again with one hand and resume your rappel. 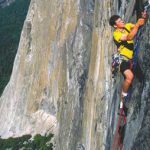 Despite this system’s advantages, some people find this backup method awkward; also, it makes controlling your rappel speed a problem, and it comes with two critical caveats. Neglect either, and your prusik backup is as useful as an unbuckled seat belt. Caveat number one: Do not clip the prusik to your harness’ belay/rappel loop. From there, it will either get sucked into your device, creating a terrible mess, or smash against your device, which will hold the prusik open, preventing it from cinching. In live drop tests where the prusik was clipped under the rappel device and to the rappel/belay loop, the backup failed 100 percent of the time! Instead, clip the prusik to the leg loop on the same side as your brake hand. While a single leg loop might not be quite as strong as a belay/rappel loop, and hanging by one leg loop isn’t ideal, a prusik here cannot ride up into your rappel device, assuming you have your prusik length adjusted correctly (keep reading). Caveat number two: Make certain the prusik’s extended loop length is no more than three or so inches. Shorter is better. Tie the loop too long and the prusik can still slide up and jam against your rappel device, where it will be held open. Practice adjusting the loop to the perfect length while hanging safely in your har- ness from your favorite tree—not on the cliffs. Some harnesses, such as those with elasticized leg loops, require shorter prusiks than others. 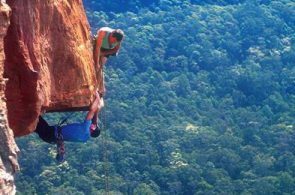 In the 1970s, we were taught to place the prusik backup on the rope above the rappel device, which at the time seemed simple and logical. It might seem as if the prusik backup is a bit too problematic. Wrong. The trick is to micromanage your backup, doing everything the same each and every time. Clipping the prusik to your leg loop is neither more difficult nor time consuming than clipping it to your belay/rap loop, and getting the correct sling length is a simple matter of 10 minutes of pre-adjustment. Properly tied and positioned, a prusik back- up will live up to expectations, allowing you to live up to yours. As you might expect, a prusik sliding down the rope will wear out quickly. 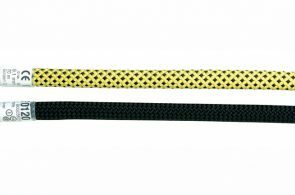 Just how quickly depends on the type and size of the cord or webbing, how tightly you cinch the prusik—better too tight than too loose!— and how fast you rap. Ideally, you’ll pre-rig your prusiks out of 6mm Perlon, which is strong and supple; otherwise, in an emergency situation, you can use whatever slings or webbing are on hand. Keep an eagle eye on your prusik; inspect it after every rappel. Backing up a rappel on two strands of rope isn’t much different than the technique for a single rope: Wrap your prusik (or klemheist;) around both ropes, and short-clip it to a leg loop. You may need to add a prusik wrap or two, or remove one, to get the prusik to slide when you hold it loosely, yet grip when released. Ascenders—aside from the Petzl Shunt— don’t work on double ropes. I once thought that, in a pinch, I could stop a rappel near the rope ends by clamping down a foot or two from the ropes’ termini. I tested my theory on a rappel where the cords hung just shy of the ground. I rapped to just above the ends of the ropes, clamped down, and shot off the rope ends. As a parting insult, the rope tails bullwhipped me in the face. No backup can perform a miracle if you rappel off the end of your rope, perhaps the most common way that people die rappelling. Thus, you should always tie a knot/s in the end of your rope. The knots will stop you when they jam in your rap device, assuming you hit them before you hit the ground. Tying a knot into the end of your rappel rope takes five seconds—there’s simply no rationale not to. The only time you might not use a knotted rope end is in gusty winds, when the knot could jam in a flake or crack if blown sideways. Likewise, while once bailing off a solo attempt on the Aquarian Wall of El Capitan, I forgot to untie the end knots from my rap ropes. I only realized my error as, while pulling the lines down, I looked up to see the knotted end of one of the lines 20 feet above me, well out of reach. Stuck at a hanging rappel station on a stretch of rock as smooth as a bowl- ing ball, I contemplated hammering the rope in half (no knife), but instead chained my aiders together, clipped all my hooks onto them, and, after a hundred or so tosses, just managed to snag the knot- ted rope end and pull it back down. Over 20 years have passed, and I have not repeated that mistake. The lesson? Always untie the end knots before you pull your rappels. For the end knot itself, tie a bulky figure-8-on-a-bight, which will not pull through your rappel device, even under pressure. Some people, myself included, clip a junk carabiner to the figure-8 loop to make it even bulkier, a wise precaution when you rappel using the relatively “loose” carabiner brake (the added weight of the carabiner helps the rope toss cleanly). Do not use an overhand knot. This low-profile knot can, under the jolt of just a one-foot drop, extrude through certain rappel devices, and easily squirts through the carabiner brake. Use a figure-8 instead. As with all things, there is a right and wrong way to knot the end of your rope (or ropes if you are double-rope rappelling). Do not tie the ends of a double rope together, or they will twist around themselves like mating serpents. Instead, tie a knot in the end of each rope. This will let the ropes spin freely, working out any twists created as you rappel. Use a backup every time you rappel— whether you’re in a hurry or not, whether the rappel seems rote or sketchy, or whether you’re one pitch up or 20. Rappelling even once without a backup is an unnecessary withdrawal from your karmic savings account. Duane Raleigh, publisher of Rock and Ice and father of two, has proudly left his sport-rappelling/freefalling days behind him.